Focaccia flavored with fennel seed and roasted garlic, in two thicknesses, and topped with an assortment of pizza toppings. Friday Night Fennel Focaccia Night, anyone? The subtitle of this could be "we I do the hard work so you don't have to" but that would imply that making focaccia is hard, which I don't think it is at all. 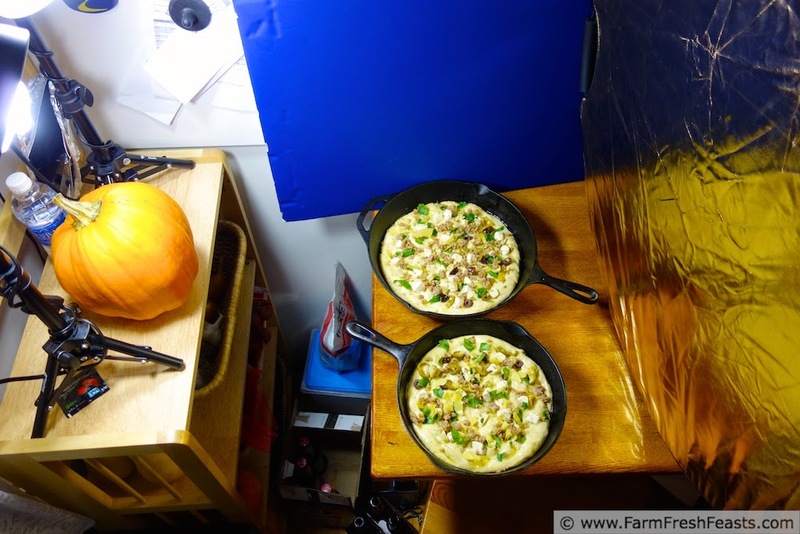 In fact, a secondary goal of this blog is to de-mystify and normalize the act of making pizza at home (to that end check out my Pizza Primer for photo tutorials on making pizza). 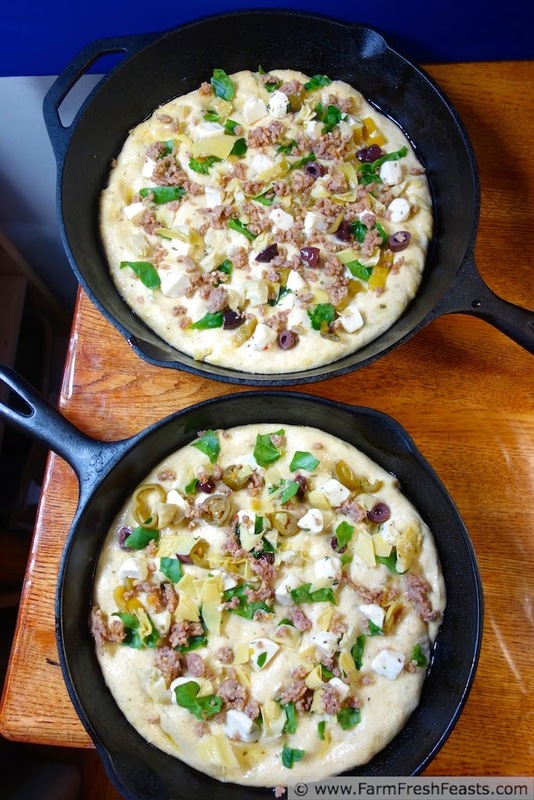 I've shared focaccia recipes on the blog before, always on Fridays, since my family demands enjoys our Friday Night Pizza Night, and this time I decided to experiment with the pan size and see which we preferred. 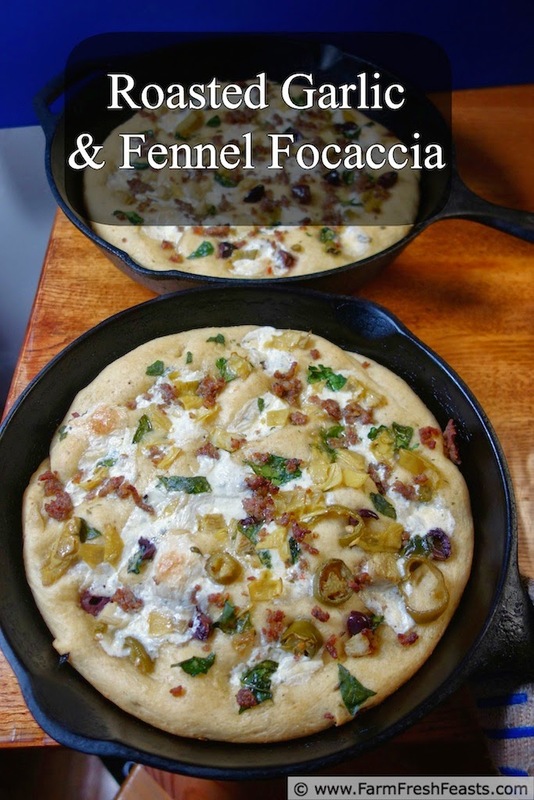 I have a 10 inch and a 12 inch cast iron skillet (ok and a little '2 fried egg' size one from my friend Miho, but that's too small for focaccia). I made a double recipe and tried a portion in each skillet. The results are shown in the first photo above. For me, I like a thinner focaccia and prefer the 12 inch skillet, but if you wanted this as a bread the 10 inch skillet would do just fine. 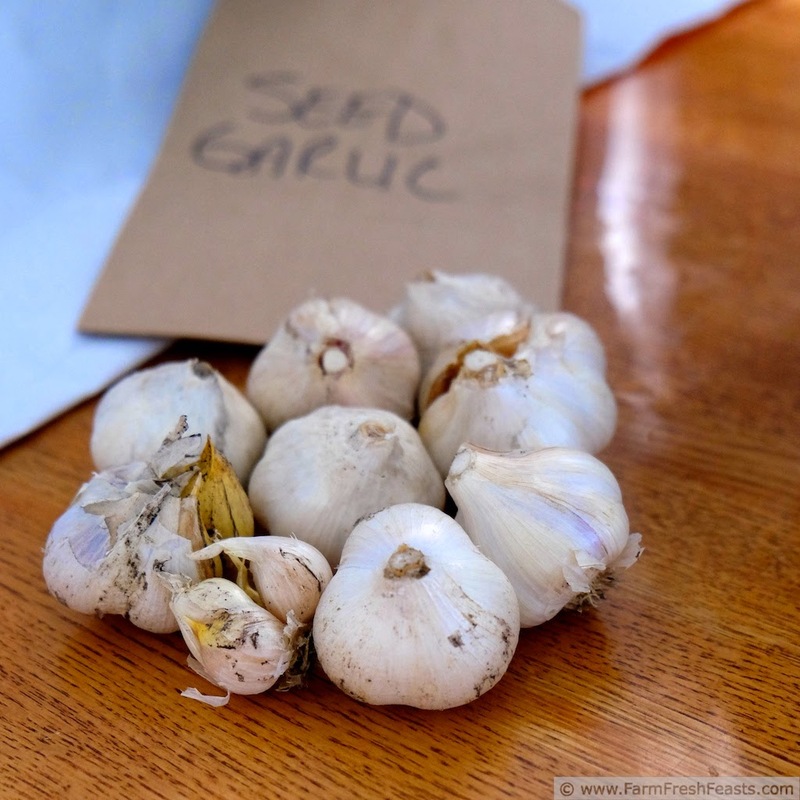 The other reason I'm sharing this recipe today is to tickle your brain about planting garlic this Fall. If you live in an area where tulips grow, and you have access to a plot of earth, you can grow garlic. If you don't get cloves from your farm share, check out the farmer's market or a gardening friend. The garlic from the grocery store is usually treated to inhibit sprouting, and you don't want that. Plant the cloves, pointy tip up about 4-6 inches under ground, sometime after Canadian Thanksgiving and before American Thanksgiving. I get more detailed about how I grow 2 crops (garlic and basil) in a single raised bed over the course of the year in this post. In the bowl of a stand mixer (if you've got one, or a large bowl) add the water and dissolve the yeast for several minutes while you gather the rest of the ingredients. Add in the seasonings and flour, then blend until the dough is starting to come together, about 3-4 minutes. Scrape down sides. Add salt and olive oil. Mix with paddle (or with a spoon) until smooth ball forms, about 5 minutes. Transfer to an oiled bowl, and let sit in a warm place for one hour. My fancy pants oven has a bread proof setting (100 degrees Fahrenheit) so I often place my dough in the oven to rise. I take it out, however, before preheating the oven to 400 degrees Fahrenheit. 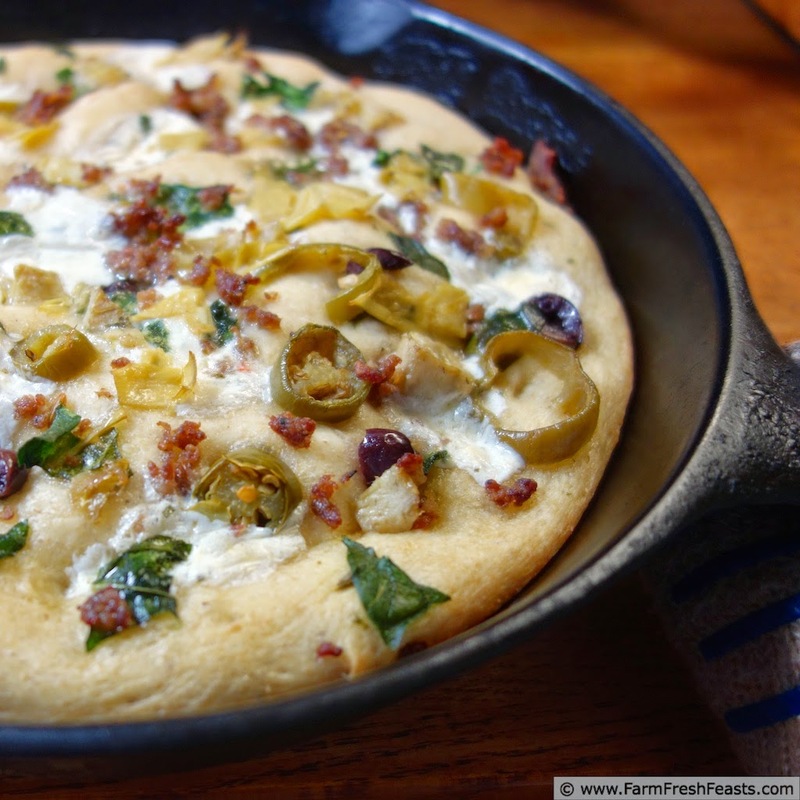 Add a splash of olive oil to a cast iron skillet (I prefer 12 inch, but have also used 10 inch) and use your fingers to push the puffy dough into an even layer in the skillet. Let rise a second time, for about 30 minutes, before topping. Bake for 20 minutes at 400 degrees Fahrenheit. Cool, slice (Amazon affiliate link to my favorite pizza cutter shown above) and serve. Another behind the scenes, since I had it--a winter set up with a peek at the Strategic Winter Squash Reserve. I'm no longer using the gold side as a reflector--while my daughter and I thought it looked cool, getting the white balance straight with the gold reflector was really tricky. She's since unzipped and flipped the reflector to show the white side instead. This is one flavor combination i have not tries, roasted garlic and fennel. It looks great, just never had a recipe.
. . . and now you do! I keep growing fennel and then letting the caterpillars (black swallowtail butterfly wannabes) eat it instead of harvesting, so I am stuck with the fennel seeds. Not a bad way to be. I think the concept of culinary bucket lists is an excellent one. Not that I want to make a formal declaration, but I'd like to try to make Ethiopian food some day. I'm a newbe to What's Cookin' Wednesday. 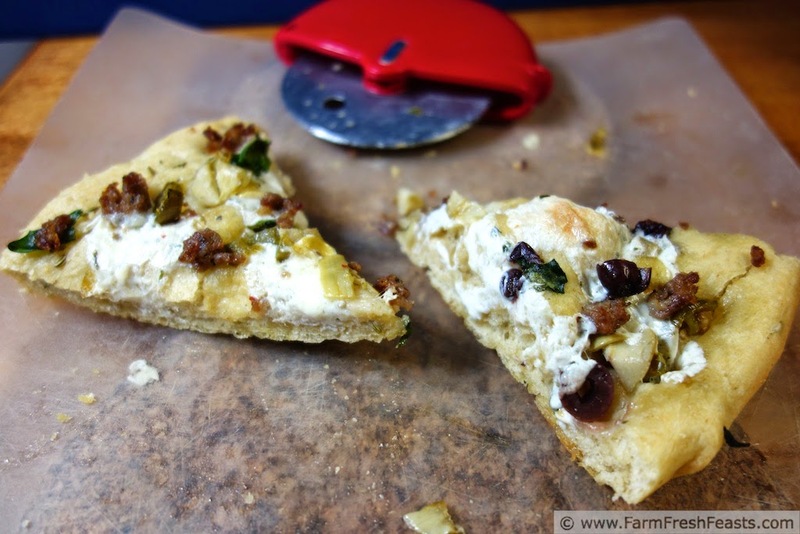 I love focaccia, and love using cast iron, but haven't baked mine in the cast iron before. Also, I love your combination of flavors. Welcome to What's Cookin' Wednesday!